Note: this cabin was also called the remote cabin. There was another, makeshift, trap cabin Norman used that was closer to home on another line. Friday, September 26, 1980—getting ready for winter, getting gear organized and materials ready to take to the bush to build a cabin. Monday, September 29, 1980—worked on getting supplies and gear and so forth ready to go to build the cabin. Tuesday, September 30, 1980—still working on getting the gear ready—made some stretcher boards. Wednesday, October 1, 1980—sawed plywood sheets in half lengthways ready to be loaded on the pontoons of a super cub airplane, and got some of the gear loaded in the pickup. Thursday, October 2, 1980—started building the dog sled and near sundown, I cut some grass hay for dog bedding. It snowed southwest of us along the mountain. With the sun shining through, the snow looked like a fire—really beautiful. Sunday, October 5, 1980—worked on the sled and got the mortise and tenon joints done and the planeing and tied six joints with rawhide. Monday, October 6, 1980—worked on the sled until 10:30. Ronning called to fly us to the trap cabin site. Sylvia is going there with me. We hurried to pack, started to fly at 2 p.m. with three loads. I made four packs to camp and set up a tent. Sylvia saw caribou and moose. Tuesday, October 7, 1980—I packed seven loads from Hole Lake from where Chris had unloaded it. He flew in with another load while I was packing these in to where the cabin will be built. This is a steep grade, at least 100 feet above Hole Lake and a little more than a quarter mile of tundra and brush to get through after that. The stove was one of the last things—it was very clumsy and heavy to pack for our camp. It rained last night, but it’s very nice today. It’s too windy though at Snowshoe Lake for Chris to fly in the plywood. Wednesday, October 8, 1980—I packed four more loads from Hole Lake to our camp, saw 12 caribou, decided on the cabin site and the cache site and packed 2 more loads. Got pretty well along with the cache. 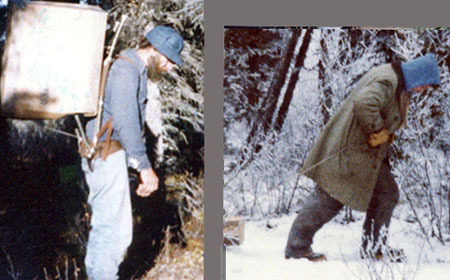 Thursday, October 9, 1980—just finished the cache and it started snowing. I rushed to build a tarp lean-to and put gear into it for a cook camp. Set up the airtight stove and put extra food up in the cache. It’s 12 feet up off the tundra. Then we got a snowstorm of 4 inches. Friday, October 10, 1980—started sawing the base logs and the chain saw quit, and then broke the mill attachment for sawing lumber. It just popped so easy. Got the saw fixed so it runs and I packed a can of gas in the morning from Hole Lake and then Chris flew in the plywood towards evening. I ran over to Hole Lake to meet him and help unload the plywood and I packed a can of gas back to the camp and I carried one bag of traps up to the top out of Hole Lake and cached it in a clump of black spruce. It was borderline flying for Chris, but he got our plywood to us before freeze-up. I told him how grateful I was that he was able to get this done for me. I really like Chris. Saturday, October 11, 1980—it was a beautiful sunrise and 1° all day. We dragged the foundation logs to the site and got them into position and got seven floor joist mortised into them. Sylvia still has a sore throat. Cleared some brush and sided logs. I lost my tape measure somewhere. Sunday, October 12, 1980—up early, beautiful day, hunted caribou (they evaded us). Saw a martin, mink, fox and porcupine tracks. Packed eight of the half sheets of plywood to camp (two packs), and finished the floor joists and nailed the plywood floor down. It’s turned cloudy. Monday, October 13, 1980—I two-sided 14 logs, peeled 9 and cut 15 more. Cut firewood and packed in eight, 2 x 8 sheets of plywood from Hole Lake. I’m very tired. Sylvia’s cold is a little better. Luckily I found the tape measure and I won’t have to guess—I can measure my logs and lumber. It’s cloudy and the geese are flying south at night—we can hear them. Tuesday, October 14, 1980—I went hunting and saw a cow moose and calf. Caribou had been near camp, there were more martin track and Sylvia’s cold is much better. No luck hunting. Wednesday, October 15, 1980—up early, warmer and sunny. Cut lots of trees today, sawed lumber for a door, table and so forth—and two-side logs. Thursday, October 16, 1980—peeled and hauled logs to the cabin with the little puka sled. Sylvia hauls the logs from the wood lot where I’m cutting them. I cut them down and two-side them. They’re six feet long. I put two in the puka and she has a rope that goes over her chest. She pulls these logs to the cabin and unloads them and comes back for the next two. This one time, she’s just ready to start out and I clicked my cheeks on my teeth and (like you do when you tell a horse to start and pull). Sylvia, she stopped, turned, looked at me, stuck her finger at me and said, “Don’t do that again!” I didn’t. I shot a spruce hen for supper and there were more geese flying south. We can hear them especially at night. Two wolves were howling this morning, they sounded really close. They must have been young wolves and didn’t know what we were. They weren’t very far from our camp, knew we were there and were howling. We put up a wall of the cabin today. This entry was posted in Journal Entry and tagged Building trapper cabin, Hole Lake, Norman packing supplies, supe cub, Sylvia pulling logs, Tolsona Creek, wolves howling. Bookmark the permalink.